I am not a fan of Warren Buffett. I don’t dislike the guy. I admire this investing record. But I think of him not as a genius investor, but more as an idiot savant. It’s not like he grew up as a poor child and made it big as an adult. His father was Congressman Howard Buffett, so I don’t think Warren grew up disadvantaged. I think of Warren Buffett as a savant because he has correctly deduced that the way to make long term investment gains is to buy good companies, in good industries, and hold. Companies like Coke and Dairy Queen have done well over the long term for him (I’m a health nut, so I don’t use any of their products, but that’s not the point). I think he’s an idiot for two of his recent philosophical positions. First, a few months ago, and then again at the annual Berkshire shareholder’s meeting last week, he stated that high income earners like him should pay more tax. Personally, I believe that higher taxes are always a bad idea, because more revenue allows government to spend more. Mr. Buffett keeps telling the story of how he pays a lower rate of tax than his secretary, even though he earns millions of dollars a year. Let’s assume I own shares in a company. The company earns $1 million in profit, and the corporation pays taxes of $250,000. The company then distributes the remaining $750,000 in dividends to the shareholder (me). I pay tax of 25% on the dividends I got, or 25% of $750,000 = $187,500. Mr. Buffett would say “see, it’s not fair, I only paid 25% tax on my income (from dividends), but my secretary has to pay tax of 30% on their income; it’s not fair!” Yes, but while I only paid 25%, the corporation also paid 25% before they distributed the money to me. On $1 million in profit, the corporation paid $250,000, and I paid $187,500, for total taxes paid of $437,500, or 43.75%, which is more than what a secretary is paying. And yes, I just made up the tax rates, but you get the point: you can’t just look at personal tax rates on dividends or capital gains in isolation. If Uncle Warren really thinks he should pay more in taxes, great. Send a cheque to your pal Obama; I’m sure he’ll cash it. My issue is that Warren Buffett believes that the government knows better than me what I should do with my money. That’s what taxes are: a forced redistribution of wealth. The government takes from the taxpayer, and gives that money to someone else. I believe we should help those less fortunate than ourselves. I agree that the income disparity between the rich and the poor is a serious problem, and will lead to continued social unrest. But higher taxes are not the answer. 50% of Americans are net tax recipients, so of course they want more taxation of the rich. The new top guy in France wants to tax the rich more. Everyone wants to milk the golden goose, but you can’t milk a goose. But I digress. 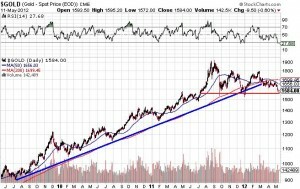 The second silly think Mr. Buffett said this week is that gold is bad (I’m paraphrasing here). You can watch the video, but basically Charlie Munger, vice chairman of Berkshire Hathaway said “I think gold is a great thing to sew into your garments if you’re a Jewish family in Vienna in 1939, but I think civilized people don’t buy gold. They invest in productive businesses.” Mr. Buffett appears to agree, but again the idiot savant totally misses the point. Yes, I agree, we should all invest in productive businesses, because that’s what increases real wealth. But what do you do with your profits? Where do you put your wealth in the interim between when you sell a business and buy a new one? Even Mr. Buffet agrees that fiat money is doomed to failure, but his solution is to buy productive companies. Fine, but that does not solve the fiat money problem. … The subject of a Hitler or a Stalin is a serf by the mere fact that his money can be called in and depreciated at the whim of his rulers. That actually happened in Russia a few months ago, when the Russian people, holding cash, had to turn it in — 10 old rubles and receive back one new ruble. … Under such conditions the individual citizen is deprived of freedom of movement. He is prevented from laying away purchasing power for the future. He becomes dependent upon the goodwill of the politicians for his daily bread. Unless he lives on land that will sustain him, freedom for him does not exist. That’s the problem with fiat money. The government, at any time, can print more, which makes everything in circulation worth that much less. I work hard and earn and save $100, but with money printing, leading to inflation, the government can easily turn my $100 in purchasing power into $90, or $9, or nothing. That’s the problem, and that’s why paper currency needs to be backed by something that can’t be printed, so that government’s cannot rob their citizens of their purchasing power. It’s a great essay; it’s called Human Freedom Rests on Gold Redeemable Money, and it was written in 1948 by the U.S. Congressman from Nebraska, the Hon. Howard Buffett, Warren’s father. If currency was backed by gold (or silver, or oil, or seashells, or anything that can’t be conjured out of thin air) it would be very difficult, if not impossible, for governments to finance bank bailouts, and wars. We would not be in Afghanistan, or Iraq, or anywhere else, because we could not afford to be there. Gold’s three year up trend is over, and the $1,584 close for gold on Friday puts us back where we were in the middle of December, 2011 (but not as low as the $1,525 level we hit briefly at the end of year). If the $1,525 level holds (and I’m betting it will), this could be the low level for the year, and a great buying opportunity. RGL.TO – Royal Gold, Inc.
AMM.TO – Almaden Minerals Ltd.
SCP.TO – Sprott Resource Corp, and a few others. My plan is to watch these carefully, but to also gradually take profits. In this market there are no long term, ten year holds. I will sell some current or next month, slightly out of the money call options. If the stock weakens, great, I can repurchase the call options at a lower price, and lower my cost base. If the stock goes way up, my calls will get called, and I lose the stock, but I pocket the profit, and then deploy the cash on further weakness. That’s the plan, subject to change. 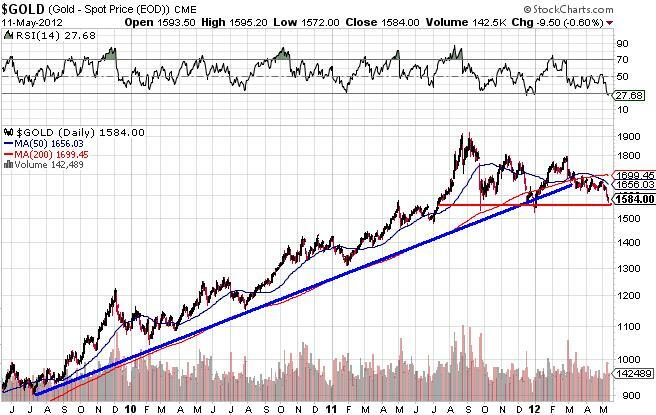 And my apologies to Mr. Buffett Jr. for buying gold stocks……..